Texas Instruments SIDEGIG-XOVEREVM Analog, Active Crossover Audio Plug-in Module turns the company’s Audio Class-D amplifier evaluation modules into a high quality, two-way speaker amplifier. The plug-in module allows it to easily remove the large and expensive passive crossover found in passive loudspeakers and produce a bi-amped, two-way system with enhanced efficiency and reduced size. The board highlights a tunable high-pass filter, low-pass filter, baffle step, and delay to produce two audio output signals for a tweeter and woofer. There are many benefits of designing active speakers including well matched and well-tuned audio. 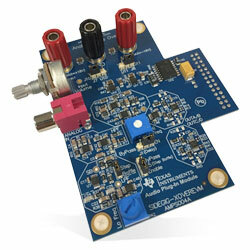 The input is provided via phono RCA jack, and output is analog, two-channel with 2Vrms differential.